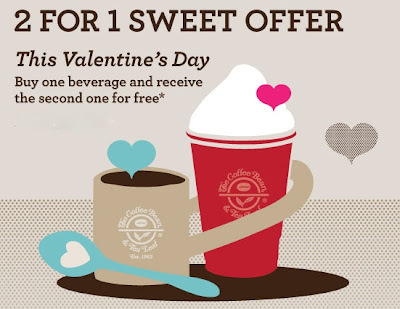 Coffee Bean and Tea Leaf is offering a buy one get one deal tomorrow (Valentine's Day)! Be sure to head down to buy your drink and get a free one for your Valentine! You can go here for location information. You know where I'll be heading tomorrow! This offer is very interesting for me.I love those coffee company who gave me a offer.I liked this Coffee Company.